Clovelly Road was transformed and re-imagined as a greener, safer, more liveable street on 27th October 2013. 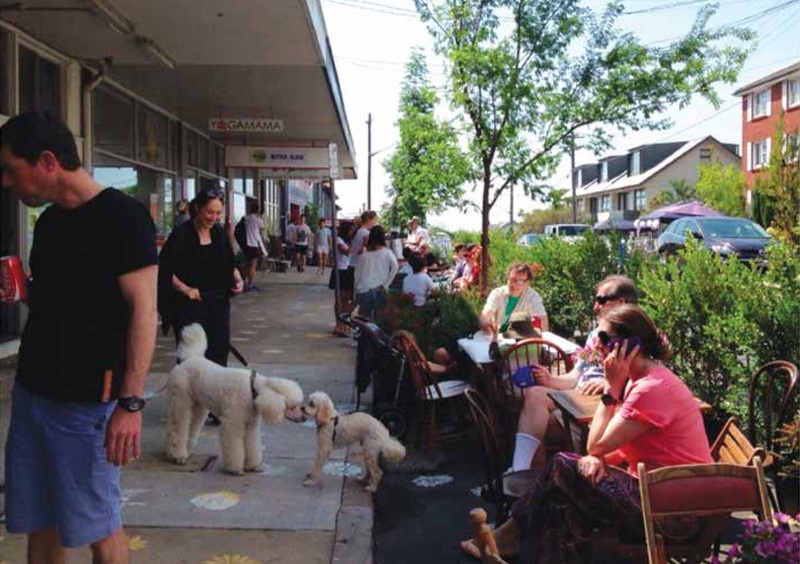 Megan Sharkey explores what those keen to reimagine their streets and communities can learn from community driven planning used in the first Better Block transformation in Sydney. The Better Block demonstration day saw over 2000 people attend, 259 survey participants, local councillors and staff, state parliamentary minister, local VIPs, media, and over 150 volunteers. The street felt alive and activated. Located on Clovelly Road between Arden Street and Beach Street intersections, the demonstration day increased greenery (over 300 plants and trees), slowed traffic by narrowing the street, utilized empty shop fronts, street furniture lined the pavements, pop-up cafes and pop-up businesses generated economic activity, included bike parking and a bike mechanic, and arts and music. Clovelly Road may be a regional road but we made it a community street. Feeling disenchanted with the state of their daggy looking block, a string of business turnovers and empty shop fronts, Phil Stubbs and Lisa Patrioni talked about how their block, its businesses and residents might become a stronger community and more aesthetically pleasing. Dreaming of a social, economic hub bustling with activity invoking a Parisian boulevard with trees, street furniture and people; Phil began researching place-making which led him to Better Block. Empowered, Phil thought we could do this here – why not it fits perfectly. Clovelly Road is a wide street where once the tram travelled. It has little pedestrian infrastructure, little greenery and deactivated shop fronts. Plans ensued and contacts were made, the first Sydney based Better Block was born. Stepping back, the Better Block ideas started in Dallas, Texas during 2010; the brainchild of Jason Roberts and Andrew Howard. They lived in a derelict, older part of town with wide streets, empty shop fronts and a struggling community needing a facelift, but they were at a loss to know how to do it. The planning process would take years before real change occurred – why not change the things they hated now? Many of the planning laws were inhibiting social and economic vibrancy to their block – why not break them? Empowered they did just that and changed their street for a day. They brought out tables and chairs, narrowed the street, slowed traffic, opened up empty shop fronts, posted all the planning laws they were breaking and invited the council. The results were amazing with lots of people attending and giving great feedback. Instantly the area was invigorated, people were at the centre of the street, and a small-scale social and economic hub imagined. Government staff were amazed and people all over the United States began contacting the Better Block founders. Thus the Better Block crusade began with the founders choosing to open source content, methods and ideas so that any group, anywhere could hold their own Better Block and put planning directly into community hands. Better Block is part of a broader movement called tactical urbanism. 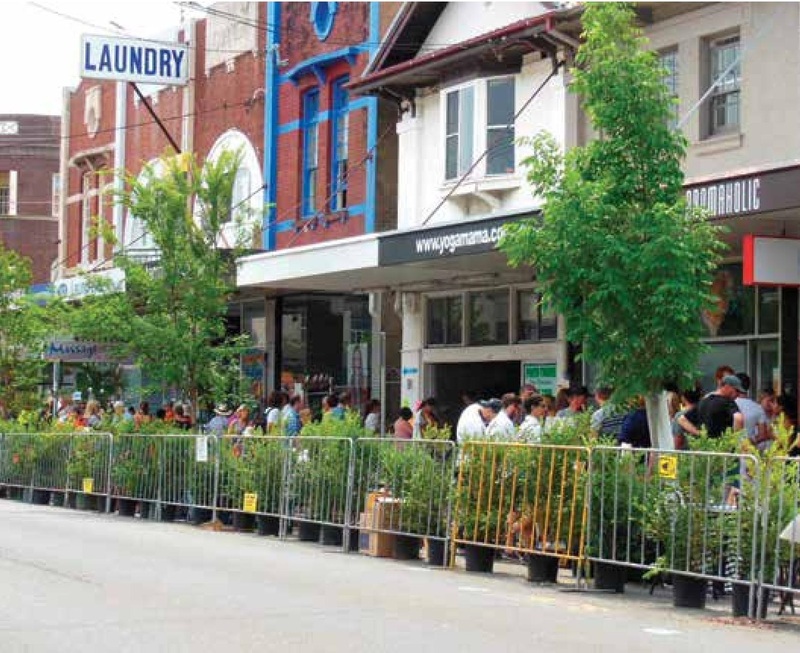 Other tactical urbanism examples include Guerrilla Gardening or Sunday Streets here in Sydney. Mike Lydon and others have summarised some of the tactics in their booklet Tactical Urbanism Short Term Action || Long Term Change. It encompasses the community and government small-scale changes to the street characterized by “an offering of local ideas for local planning challenges, short-term commitment and realistic change, low-risks with a possibly a high-reward, and the development of social capital between citizens”. The community are getting involved, driving the planning process and make their voices heard. Clovelly Road Better Block demonstration day was the culmination of hard work, time and ideas by a core group of local resident volunteers, led by Phil, with business input and additional volunteers supporting on the day and throughout. The planning process for the Better Block day began early in 2013. Phil began by contacting the broader movement, local councillors, key partners, such as UNSW, Bike East, and Transition Randwick for support, funding partners and attending local precinct meetings. At this stage it was a two person driven process to gain support (Lisa, Phil’s partner, supported him with ideas, artistic design, and general help). Phil attended approximately 10 group community meetings, such as ThinkActChange and BikeEast, to pitch the idea, solicit additional volunteers, strategic supporters and to promote the first Better Block meeting. The first community meeting, “Have Your Say” in August 2013, introduced locals to the Better Block idea, surveyed them and asked for volunteers. Over 80 people attended this meeting. During this meeting, volunteers could assign themselves to the broadly organised teams required for setting up the Better Block. Our teams, for example, were transport and traffic, arts and kids, landscape/greenery, logistics, council, media and print, businesses, and market research. A second meeting two weeks later established the core group of lead volunteers, approximately 15; the team leaders were the most enthusiastic and dedicated, they showed up and committed time! Each team leader was responsible for their “sub-volunteers”. Phil Stubbs and myself worked together to liaise between the teams for overall cohesion. The suggestions and ideas from the “Have Your Say” survey and place-making research guided the teams to the changes desired and required to enable a greener, safer and more liveable street. The majority of the team leaders took ownership of their team and really enabled the day to happen and become a success. In addition to ideas, the “Have Your Say” survey was turned into a two-page briefing note and utilized as a business and council information tool. The group held three additional meetings at Creativity Unlimited, our local art studio and Better Block meeting space. These meetings allowed us to hash out logistics, have creative design sessions, form community bonds and keep everyone accountable. Communication is important away from these meetings and can be very difficult when volunteers have full time jobs. The Clovelly Road Better Block utilised a few communication methods internally and externally. Internally, google documents, dropbox, email and phone were used. Google docs allowed volunteers to see who was on the team and basic strategy; after a few weeks this communication tool became ineffective. Dropbox was utilised for large file sharing. Email became the main form of communication. Externally, the group utilised facebook, instagram, mail chimp, twitter, vimeo, survey monkey, and pinterest. Facebook and twitter were the two most used communication tools. Mail chimp provided a good platform to email invites professionally; likewise, survey monkey was a good survey platform. Strategic partners were an integral part of this project as well. For example, University of New South Wales provided strong support and they received mutual benefit as well. UNSW became a partner through PhD candidate and lecturer Laura Goh. They assisted by having their first year planning students work on a real world project. Many students attended our first meeting, we held a private information session for them and all students volunteered on the day: Two even wrote content and provided research on the Better Block feedback report. Distinguished professor Michael Neuman provided technical expertise as well. Our partnership with them gave us interesting insights, a testing group for the demonstration day survey, and the students saw up close and personal the transformation of a street in real time. The whole group were bound by the council and logistics team. Council approval for the “event” was sought; though in the first United States Better Blocks they just did it. Subsequent Better Blocks (USA) have since received council support or are being driven by councils themselves. The Clovelly group sought council approval to hold the event with the caveat that we could break some planning rules. This was the hardest part of the process. As Phil stated, “The council were a bit wary of us initially. They’d seen it all before [community groups with grand ideas]. They replied to about 10% of our emails and contact […] or didn’t understand what we were trying to achieve.” Many concessions were made on both sides. For example, the group wanted the Better Block demonstration to extend further west on Clovelly Road past Arden to include the whole neighbourhood centre and the council wanted concrete barricades around the park-lets and pop-up business. We negotiated metal fencing barricades. Additional features, such as pedestrian crosswalks were also vetoed. One rule break was the painting of street art on the ground. People loved it. We did it though had been forewarned to not paint. Bringing in the council prior to the event, rather than the just do it approach, enabled us to have an open dialogue, as well as really engage with the council. This, in the long run, has enabled us to move forward with council discussions in an open positive way. On the day councillors and staff were blown away by the result and really changed their “wary” view. Since then a few have suggested we hold Better Blocks in other areas of Randwick that could use it. Council approval in the Australian context is key; it can be stifling but is needed. The first Better Block in Sydney, as well as, two in Melbourne, broke down the first wall. This will help in the future, but will more flexibility to break the rules be allowed? Another big barrier to both the Clovelly Road Better Block and the breakdown of the Bondi group is the time commitment placed on the leader. Phil Stubbs dedicated nearly six months of unpaid work to this project and Avi Melkiner, of the Bondi group, found that as the leader she could not continue to afford the unpaid work. A more defined management structure and bringing additional volunteers in early could remove some of the work load from the leader, but it would still require a significant time commitment. Council support, at least within Randwick, will also make this easier in the future. Time commitment comes from the leader, core volunteers who averaged three to ten hours a week (over two to three months) and on the day volunteers who worked in one to three hour shifts, six hours in a pop up, or even all day including setup and breakdown! Monetary costs for the day included event insurance, transport costs for trees and plants; in kind support from Randwick Council for security and barricades, printing and design, and a few other incidentals totalling approximately eight to ten thousand dollars. This required sponsors and made strategic partners like Council necessary. Crowd-funding and community grants could assist further in the future. Utilizing your local knowledge base is key. The local individuals who utilize the place each and every day will know what is missing, what makes things difficult, and what is on their wish list. Locals can also provide great skills! Our volunteers, who were local residents, are professionals. They are artists, graphic designers, architects, arborists, urban planners, traffic engineers, electricians, business owners, academics and students. Encourage ownership of the project by residents and local businesses. Reading 100 plus emails a week is very ineffective and time consuming. Open platform communication across multiple parties could be improved by applications such as igoogle or yammer. The event is as much about social inclusion and development as it is about physical infrastructure. Follow-up within a month after the Better Block event with council is important if real short-term changes are to be implemented. On the plus side, this event was seen on the worldwide stage, with Better Block co-founder Andrew Howard, talking about it in England. Coogee MP Bruce-Notley Smith had a parliamentary briefing on the event and there was heaps of media coverage. It has put Randwick Council in the spotlight, piqued interest from neighbouring councils and acted as a catalyst for other community groups. In March 2014 a group of core volunteers got together to move the concepts of Better Block forward and keep the council momentum and discussion going. They formed ParktoPacific, which builds on the ideas of Better Block and looks to enact small-scale community driven changes on Clovelly Road from Centennial Park to Clovelly Beach, as well as develop social and local business capital. It has begun publicising the Clovelly Road Better Block Feedback Report with background of the area and Better Block, and research from the day. On May 6th they presented at a Randwick Council briefing session receiving positive feedback and ideas from council. On 10th May they hosted a community meeting at the Randwick Literary Institute (RLI) with speakers including Mayor Scott Nash (Randwick), MP Bruce Notley-Smith, MP Matt Thistlewaite, and Mayor Sally Betts discussed complete streets; it gained further support for another Better Block for 19 October 2014 in Clovelly. The next meeting on 25th May at the RLI will be the first volunteer working session for the next Better Block demonstration and is open to all. Phil Stubs has since returned to focus on his business full time, but has been researching grants and partners, such as Project for Public Spaces (PPS), to enable long-term change of his block. Other groups have begun to follow suit. A Bondi group was started and even received Waverley Council funding and support to hold its own Better Block in July. This has unfortunately been put on hold and Avi Melkiner has joined Street Talk to keep moving forward by building resident and business relations, with other core members still doing support in their own ways. I hear whispers of a group in Marrickville discussing a potential Better Block or tactical urbanism movement. Clovelly Road will hold a second Better Block to be highlighted during the Walk 21 conference which will showcase the event; the ParktoPacific group will be organizing along with locals, businesses and supporting partners. More and more I hear people from the Sydney area talking about community planning and meeting people involved in projects like Better Block. The movement has begun and the community is taking their streets back. Megan Sharkey helped co-ordinate Clovelly Better Block. She is an environmental planner and sustainability consultant and is on the steering committee for ParktoPacific. Photos appearing in this article are courtesy of Sara Stace, Ari Anderson, and Emily Whitworth. Lydon, et al (2012). Tactical Urbanism 2. Street Plans. Miami. Available at: http://bettercities.net/sites/default/files/Tactical%20Urbanism%20Final.pdf Accessed in April 2014.